One of the best grandmasters to never play for the world championship, Miguel Najdorf left a legacy that has aided millions of players in their opening knowledge. The foremost leader in the Najdorf Variation of the Sicilian Defense, he was also one of the first players to receive the Grandmaster title and broke the blindfold chess world record twice. Najdorf was able to accomplish all these things despite working in the insurance business and not being a full-time chess professional! Miguel Najdorf started off his chess career by defeating Glucksberg in a famous game that came to be called “The Polish Immortal”. He represented Poland in four Chess Olympiads before moving to Argentina in 1939. This happened after the start of World War II and Najdorf was in Buenos Aires playing in the 8th Chess Olympiad. He decided to stay in the country because of the turmoil going on back in Poland and by doing this, he was able to avoid the Holocaust. From 1939 to 1947, Najdorf had many successful tournaments and matches which catapulted him into the list of world’s top players. For a stretch of years from 1947-1949 he was the second ranked player in the world. Despite this, Najdorf never had the chance to play for the World Championship. He continued to play chess until the end of his life. Even at the age of 81 he played in a national championship. 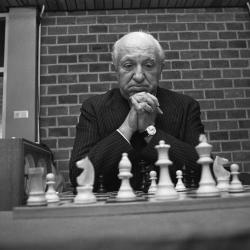 Najdorf passed away on July 4, 1997.